There are few services, I think, that give me quite so much enjoyment per shilling as Audible. For anyone not familiar with it, Audible is the biggest retailer of audiobooks. These are normally rather expensive things retailing for around £20-30 each, but if you like them enough you can take out a subscription which gets you a book each month for £7.99. Since I spend about an hour a day walking the dog, or driving to and from dog-walking spots, I manage to ‘read’ a lot of books this way simply by tucking my phone into my shirt pocket – I don’t even bother with earphones. And then there’s shaving, and ironing, and train journeys and flights and… well, you get the idea. I read quite a bit more this way than I do when lying in bed, and remember it better, because I’m not half-asleep at the time! Also, since Rose and I have fairly similar tastes in reading, we both get to benefit from the subscription. Unabridged audiobooks are typically 10-20 hours long, but I have also listened to Scott Brick’s recording of Atlas Shrugged which runs to 63 hours and still only counts as a single credit. Now, that’s pretty good value for £7.99, I think! How often have you thought, “I’d like to read that, if only I had the time”? Well, perhaps this is a good way to enhance your commuting time in the coming year? 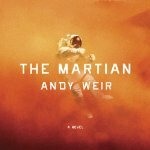 The Martian by Andy Weir, read by R.C. Bray. 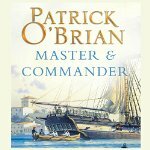 Somebody described this as “Robinson Crusoe on Mars”, which tells you the basic plot, but it’s very nicely done, and has an interesting history: the author serialised it on his web site, then self-published it on the Kindle, and in about a year it’ll be a Ridley Scott film starring Matt Damon. I thoroughly enjoyed and was gripped by this – it’s a great plot – but it does come with one warning: don’t give it to anyone who’s likely to object to strong language! 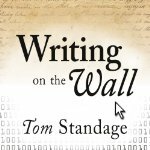 Writing on the Wall by the ever-wonderful Tom Standage of The Economist, read by Simon Vance. Subtitled, “Social Media: The First 2,000 Years”, it examines many of the communication methods we consider novel today and finds their predecessors in the world of ancient Rome, the pamphlets of Martin Luther, the early days of radio. Very readable and educational stuff. Your Deceptive Mind by Steven Novella is rather different. 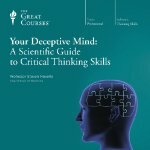 Novella is a clinical neurologist at Yale, and this is a set of 24 lectures on critical thinking published by The Great Courses. How can we know what is true? What are the different ways our brain deceives us? What are the strengths and limitations of the scientific method? Critical Thinking wasn’t a subject we had at school in my day; it should be compulsory now. Anyway, I hope these are recommendations are useful to somebody. It’s worth noting, by the way, that these are on the UK store: if you’re in another part of the world you may have a different selection available (and need to use different links).